Copyright with a friendly smile by Michael Alan Ross, 2007-2018. 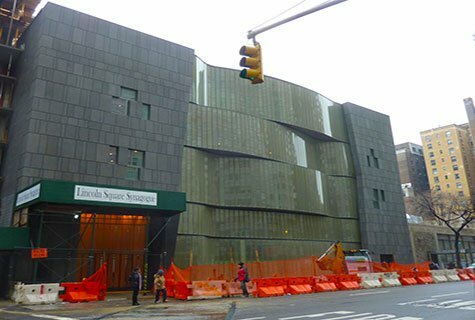 This liberal shul, very close to the great theaters of New York, not only serves its religious functions but also has become a synagogue for the arts. On any day of the week, visitors will discover there ongoing dance, yoga, and fine arts classes. 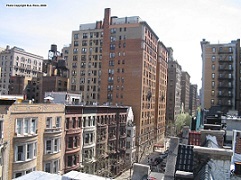 It's located on W47th Street, near 8th Avenue. A great place to begin by reflecting on continuing Jewish involvement in New York theater arts. We're heading north on 9th Ave which quickly becomes Columbus Avenue. Just past Lincoln Center (which also reflects considerable Jewish involvement), we'll discover 4 synagogues, the first two adjacent to each other on the west side of Amsterdam Avenue. West End Synagogue is a warm, friendly, reconstructionist shul whose congregants are down-to-earth and family oriented. Lincoln Square Synagogue is modern orthodox and attracts a fairly large singles population as well as young families. 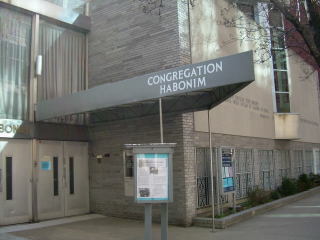 Congregation Habonim is an egalitarian conservative synagogue on W66th St, a half block east of Columbus Avenue. 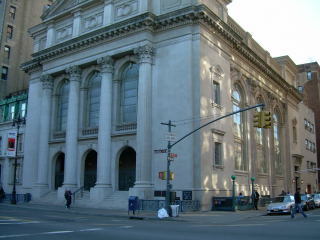 Stephen Wise Free Synagogue is a reform synagogue on W68th St, almost exactly 2 blocks due north of Congregation Habonim. The Free Synagogue particularly prides itself on principles of freedom of speech on its pulpit, unreserved seating, and social service. While in the Lincoln Center neighborhood, we'll also mention 2 other vibrant Jewish organisations here: Drisha on W65th St and Makor in its Steinhardt Building on W67th St. Drisha, particularly, is dedicated to opening doors for orthodox Jewish women to engage in Jewish textual studies. Makor provides a venue for Jewish singles to participate in Jewish culture. We now venture onward into the lower W70s. Shearith Israel is a warm, welcoming, fascinating Sephardic synagogue combining classical rituals with modern thinking rabbinic leadership. Rabbi Angel provides insightful, enlightened shiurim. 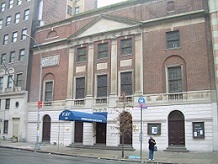 Shearith Israel is located on Central Park West at W70th St.
Hineni represents traditional orthodoxy principally to Jewish singles of all ages. Rebbitzin Jungreis is a captivating espositor of weekly shiurim. Hineni is located on West End Avenue one block south of W72nd St.
is sort of a traditional, store-front shul, on the 2nd floor of a retail building on W72nd St between Broadway amd West End Avenue. Its services are an amalgamation of egalitarian conservative, renewal, and modern orthodox. We're walking further up the W70s now. West Side Institutional Synagogue sometimes combines modern orthodox study with more traditional orthodox ritual. For example, I enjoyed a Shabbat shiur taught by Rabbi Einhorn, a mincha service, and a seudah shlishi enlivened by the participation of Rabbi Elbaum's strimel-wearing congregants. 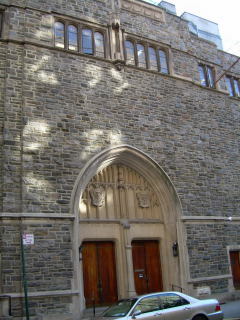 The West Side Institutional Synagogue is located on W76th St. The Carlebach Shul (aka Congrgation Kehilath Jacob) is a small effervescent house of joyful worship and comradery. Particularly, Rabbi Citron and Rev Zwe Padeh gently will encourage your Jewish explorations. The Carlebach Shul is located on W79th St.
is a community center reflecting many aspects of Jewish culture. From lectures, to classes, to concerts, to Israeli dance, the JCC provides a 7-day week of Jewish intensity. 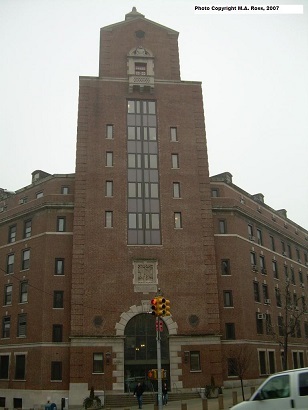 The JCC is located at the corner of W76th St. and Amsterdam Avenue. Finally, we're approaching the heart of the activities of upper west side Jewry as we enter into the W80s and W90s. Let's first mention two schools, one public and one private before describing the shuls. Brandeis School. Louis Dembitz Brandeis is noted for serving as the first Jewish associate justice of our US Supreme Court and for his devotion to the founding of Israel. He lived most of his adult life in Boston, MA. Click here to discover Justice Brandeis' Boston residences. Edward Albert Filene, one of two Filene brothers who grew their department store into one of the founding businesses of Federated Department Stores, today part of the Macy's conglomerate, also lived in Boston near the Brandeis residences. Click here to discover E. A. Filene's residence. The Brandeis School is located on W85th St.
Heschel School. Abraham Heschel, a philosophy professor at the Jewish Theological Seminary, particularly was instrumental in describing the conservative movement's appreciation and awe of God and Shabbat. His sense of acting upon our golden rule was most poignantly expressed by his walking arm-in-arm with the Reverend Martin Luther King in the Civil Rights era. The upper west side has honored both Brandeis and Heschel with schools named after each man. 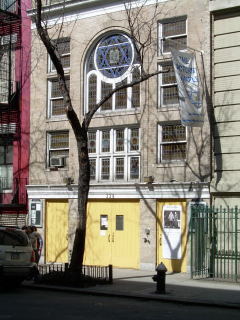 The Heschel School is located on W89th Street. The centerpiece among the synagogues for the non-orthodox is BJ. The ruach at this shul rocks the rafters. My favorite experience here is the early kabbalat Shabbat service. Go to get revved up for Shabbat. Go with an open mind. Go with an enthusiastic voice. Go early if you expect to get a seat. BJ is located on W88 St.
Kehillat Hadar (egalitarian traditional) which meets on W96th St.
Darkhei Noam (modern orthodox) which meets on W89th St.
West Side Kollel aka Beth Israel Center (orthodox) which meets on West End Ave between W91st & W92nd Sts. Kehilat Orach Eliezer (KOE) (modern orthodox) which meets on W103rd St at Amsterdam Ave.
Kol Zimrah (egalitarian creative reform/conservative) which meets on W106th St.
Kehillat Romemu (egalitarian innovative renewal) which meets on W114th St.
Ohav Shalom is a very heimish, modern orthodox shul. Its compactness easily lends to rousing traditional davening with a warm knowledgeable comraderie. Ohav Shalom is located on W85th Street. Young Israel of the West Side has a beautifully renewed main sanctuary. Young Israel is located on W91st Street. The Jewish Center has an expansive theater-like main shul, with a low mehitza gender separator. Upstairs in the same building Manhattan Jewish Experience encourages growing Jewish ritual in a considerably less formal setting. 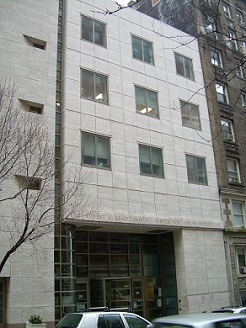 The Jewish Center and Manhattan Jewish Experience Building is located on W86th Street. is a reconstructionist synagogue with sometimes innovative and wide-ranging Shabbat programming. It's led by Rabbi Michael Strassfeld of Jewish Catalog renown. SAJ is located on W86th St.
provides continuing traditional (orthodox) informal education classes primarily for working Jewish singles. It also occasionally sponsors socials. 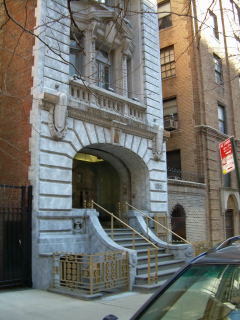 Aish HaTorah is located on W83rd Street. is a large synagogue, representative of reform Judaism. It has active and interesting programming. Rodeph Shalom is located on W83rd Street. Shaare Zedek is a friendly, egalitarian conservative synagogue on West 93rd Street. Its the only conservative shul on the west side which has Shabbat mincha and seudah shlishi. Ohab Zedek is large. While women are almost invisible during davening, opportunities for learning welcome both genders. Ohab Zedek is located on W95th Street. Chabad of the West Side also includes wonderfully welcoming folks. Friendliness combined with good food and illuminating shiurim make this shul worth a visit. 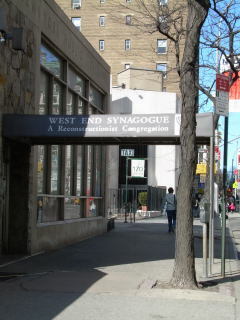 Chabad of the West Side is located on W92nd Street. Ansche Chesed is a conservative shul which, in addition to regular services, provides a super Jewish social/cultural hall. Reba Perez of Empire Dance periodically teaches ballroom dance lessons there. A conference on conservative Judaism and halacha and minhagim was held there recently. Ansche Chesed is located on W100th Street. The Jewish Theological Seminary (JTS) is the fermentation cellar for the expressions of conservative Judaism. It's where Torah and Talmud are taught religiously. It's where talmidim are encouraged to argue and question and even re-interpret posuchim. Its commitment to dynamic covenantal Jewishness almost is singular among Jewish religious institutions. JTS is located on W122nd Street. Ramath Orah permits mixed seating for lectures and discussions. I listened to an excellent exhange of ideas between Rabbi Shmuley Boteach and Michael Steinhardt there. Ramath Orah is located on W110th Street. Robert Kraft grew up at the same synagogue as myself, Kehillath Israel, of Brookline Massachusetts. I take special pride in his success as owner of the New England Patriots and the philanthropy which he contributes such as this Jewish center at Columbia University. Just past JTS, are two small but fascinating synagogues: Commandment Keepers Ethiopian Hebrew Congregation and the Old Broadway Synagogue. Each is traditional and colorful in its own way. Commandment Keepers is located on W123rd St and Old Broadway (aka Chevra Talmud Torah Anshei Marovi) is located one block east of Broadway at W125th St.
Ozu Restaurant and Supersol Market, are two of my favorite retailers of the Upper West Side. Ozu is located on Amsterdam Avenue between 86th and 85th Streets. 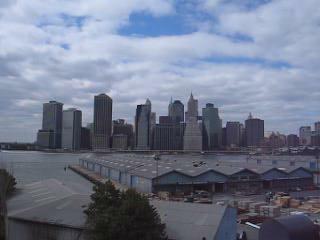 Supersol is located on Amsterdam Avenue, near 92nd Street. 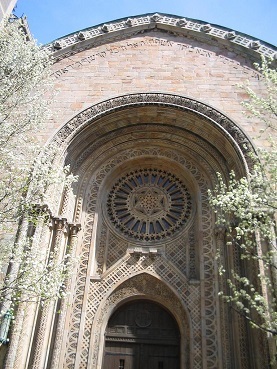 Hope you'll likewise enjoy visiting these sites of Jewish experience in NYC's Upper West Side. It also includes North End synagogues and Hebrew schools, West and North Ends immigrant settlement houses, and other reminders of Jewish life. The Jewish Friendship Trail in Cambridge includes Central European sites in Inman and Central Squares and sites of Jewish life in and around Harvard University. To discover BostonWalks' walking tours on your own, click here to purchase BostonWalks The Jewish Friendship Trail Guidebook!